It can be frustratingly difficult to find good real estate for sale in Paris at reasonable prices. There is no comprehensive listing of properties for sale – up to 40% of sales are for sale by owner – and there are around 3,500 agencies. 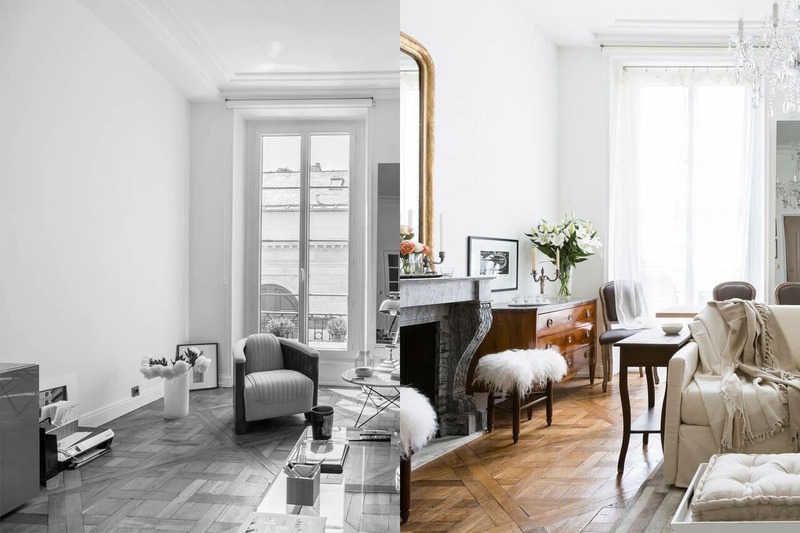 Only by doing a thorough search can you be assured that you are buying the best property available, at the best price, and optimizing your time on the ground in Paris. Our competitors do not provide this rigorous end-to-end service, and you could search months or years and not achieve the same result on your own. Once we’ve found the right property, we do due diligence to ensure that there are no negative surprises, negotiate hard on your behalf and connect you with all the resources you need through closing and beyond, so that your purchase process is simple from start to finish, including assisting you with all your property management needs after closing. It is a cost-effective way to ensure your peace of mind, and as an added plus – when you work with a licensed agency the fees are tax deductible when you sell. Our clients tell us we save them time and money – and that they couldn’t have done it without us. Can I rent my property? What are the necessary steps for purchasing a property in France? 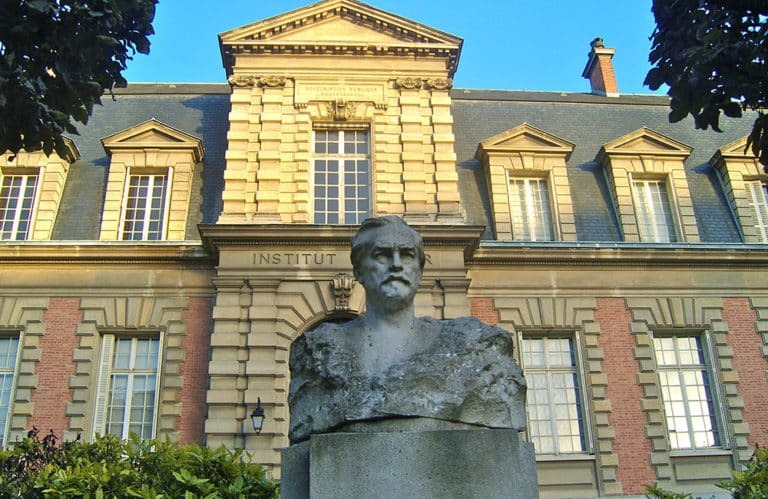 What is the role of the notaire? Are there more/less tax advantageous ways to purchase a property in France? What about a property inspection? 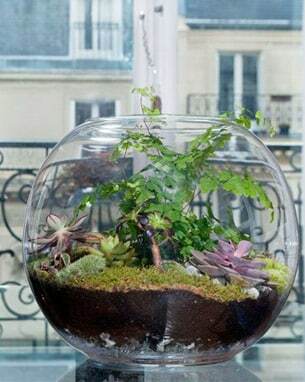 Are there other arrangements to make at the time of purchase? How can I manage my property when I’m not in Paris? Who pays the broker fees, the buyer or the seller? Is Paris real estate expensive? Is it possible to finance property in France? What closing costs and fees must be paid on a property purchase in Paris? How is the purchase completed, and must I be in France for the final signing? Who is committed to what at the signing of the preliminary contract? Is Paris real estate a good investment? Can I move money into and out of France freely? After I have settled in, what other ongoing costs and property taxes are due on Paris real estate? Why should I choose PPG to help me buy a property in Paris? What should I know about French wealth taxes? Can I find an apartment in Paris on my own? Long term rental of a property (one year or more) is permitted by any property owner. Short term vacation rentals in Paris are permitted only by fiscal residents of France renting their primary residence for up to 120 days per year. This law has been imposed under the past two Mayors of Paris and is subject to change by future City governments. Pied-a-terre buyers have managed these restrictions by reserving their personal time at the property for periods between rentals, and by adding a liberal cancellation policy to rental contracts so that renters can adjust their stay to more flexible time frames. The Macron government has proposed allowing rentals of as little as one month, but it has not yet been made law. The essential purchase process is divided into two stages. The purchase is first formalized by a preliminary contract that may be prepared either by a notaire – a promesse de vente – or by an estate agent or privately between the parties – a compromis de vente. In either case, the seller is obligated to sell immediately upon signature, whereas the buyer has a 7-day period of reflection during which he can withdraw from the purchase without any financial penalty. The sale is finalized with a formal deed of sale, the acte de vente. Regardless of the form of the initial agreement, the signing of the acte de vente is overseen by a notaire. Once the preliminary contract is signed, it is ordinarily between two to three months until the acte de vente is signed. During this time, the buyer obtains any needed financing, and the buyer’s notaire verifies good title to the property and takes care of other legal and administrative requirements surrounding the sale. At the signing of the acte de vente, the buyer pays the purchase price plus all taxes, fees and commissions, the keys are handed over by the seller, and ownership of the property passes to the buyer. From the signing of the preliminary sales agreement to the final closing, the process generally takes between two and three months. The notaire is a public official with legal training (but different from a lawyer) who prepares and registers official acts such as wills and property ownership transfers. Notaires enjoy a very privileged and highly respected position in French society. Informing any person or entity with preemption rights of the impending sale, so that they may decide whether they wish to purchase in the place of the buyer. In some areas of Paris, the city government has a right of preemption on any property sale. Calculating and collecting the stamp duties or purchase taxes, commonly known as “notaire fees”. A detailed breakdown of the notaire fees is provided below. A notaire is different from a lawyer, since his primary role is to ensure that the transaction is legitimate and that the official requirements have been met. A good notaire, of course, is also an advocate for his client’s interests. One notaire can represent both parties in the transaction, or each party can have their own notaire. The total fee is set by law and paid by the seller, regardless of whether there are one or two notaires involved. Having your own notaire is usually advisable. in the name of an SCI (société civile immobilière), a company specifically structured for owning and managing properties in France. Each method has its own advantages; the best structure depends on your own personal circumstances and your intended use of the property. For example, SCI’s are only allowed to rent out their properties unfurnished; so if you are looking to do furnished rentals, that is not the right purchase structure. It is important to address the ownership issue early on and to purchase correctly, because substantial fees and taxes are assessed any time the property changes hands or if you change your holding structure. In this regard, if you create the right structure so that a property passes smoothly to your inheritors without “changing hands,” your inheritance tax savings can be substantial. Having the right information and choosing the right ownership structure is the key to maximizing the potential of your property investment. These tests are performed by companies that certify their results; if they prove to be incorrect, you will have recourse for compensation. However, they are informational: the seller has no obligation to correct any problems that are revealed. It is thus important that you read and understand the tests, so that you can make an informed decision whether to purchase. You can also choose, at your own cost, to have the property you intend to buy surveyed. However, additional surveys are ordinarily not performed and, particularly in Paris, ultimately prove to be of limited use. A survey may be advisable for properties purchased outside of Paris or other metropolitan areas, particularly of independent houses, as their condition may be less certain. All property in France is governed by French inheritance laws, which include certain forced inheritance provisions. Particularly for buyers without children, or with children from previous marriages, it is worth consulting an attorney and possibly drafting a separate will to govern inheritance of your property in France. You will also want to establish homeowners insurance on the property and its contents that should be effective as of the date of close. Once the purchase is complete, you will want to have utilities transferred to your name, and set up telephone, Internet and other services. If you want the building management company, the syndic, to send you quarterly statements and other information overseas, you will need to get in touch with them to let them know your home address. 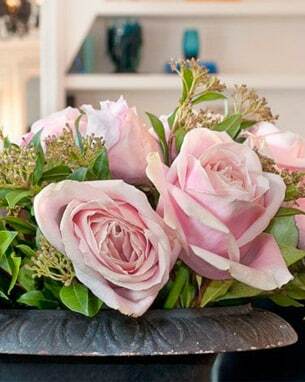 Paris Property Group will take care of these arrangements for clients as part of our start to finish service. It is customary, as well as convenient, to set up automatic debit of these bills directly from a French bank account, so that you are not struggling to keep up with bills from afar. How many clients does my search consultant work with at any given time? Paris Property Group provides an end-to-end, complete service which includes the ongoing care of your Paris real estate. Partnering with ApartCheck to monitor your property while you’re away, making sure that everything runs smoothly in your apartment. We provide continuity of care and maintenance in your absence for a low annual fee so you can be assured that your home is safe, secure, and ready for your return. Agency fees are included in the listing price that buyers see for a property. Listing fees are ordinarily about 5%. The purchase is ordinarily structured so that the buyer pays the seller and the seller pays the agency out of his total. But, it is also possible for the purchase contract to separate the two, with the buyer paying the seller his net price and the agency fee separately. The advantage to most buyers of this second option is that they do not then pay notaire fees on the agency commission amount; a significant savings. But, for non-resident buyers who need the maximum possible financing, banks often will not finance the agency fee if it is paid in this way. Since there is no loss or gain either way to the seller, the buyer should be aware of this issue and ask for the structure that best suits his needs. Paris real estate has been an incredible investment over the past decades, rising dramatically in value since the early 1990s. The average price in some arrondissements has doubled, tripled or even nearly quadrupled over the last 25 years. A shrewd acquisition then could earn three and a half times the original investment. Even so, prices for property in Paris is still affordable compared to other top destinations. Rated on practical, financial and emotional factors, Paris ranks in the top 5 compared to other cities around the world. Practical factors include connectivity via air travel, access to learning institutions, personal safety and environmental performance. Emotional factors take into account the abundant cultural and historical treasures, as well as luxury shopping. Financial factors include ease of doing business, value for money, tax climate and safe haven status. Even at the height of a crisis, the real estate market in Paris doesn’t collapse. The stock market might drop significantly but Paris real estate is fairly recession-proof because property in the historic center is extremely limited – and Paris is a top destination. Paris real estate is more affordable than in New York or London. While prices in London exceed 35,000 euros per square meter – and that’s even after a 15 to 20% decrease over the last year, partly due to the Duty Stamp (a 13% tax on non-residents) and Brexit, Paris has a very different market, with prices per m2 between 9,000 and 25,000 euros per square meter, depending on the neighborhood. French banks will lend up to 85% of the assessed value of the property and renovations to most non-resident buyers. French banks respect a very strict loan-to-income ratio for issuing mortgages, although some are more flexible in considering assets and investment income. Mortgage rates can be fixed or variable rates or a combination of the two. French banks require borrowers to obtain life insurance to guarantee the loan. If the buyer is seeking a loan in France, the preliminary contract will include a conditional clause for financing. The clause sets out the intended loan amount, rate of interest, and length of the term. If the buyer cannot obtain a loan on terms at least as favorable as those specified, he is released from the obligation to buy the property without penalty. Note that with higher priced properties, the seller may choose a buyer who does not have a conditional clause over one who does. So, agreeing to waive this conditional clause can be a real point of negotiation. Also note that, if you will be seeking financing only outside of France, the conditional clause will not protect you. It is advisable to be in contact with banks or a mortgage broker at the start of your property search, so that you know what your borrowing capacity will be and will have all your documents ready once you have found the right property. Miscellaneous expenses – calculated according to various documents that the notaire must search and examine in order to draft the deed of sale. They usually amount to less than €700. The notaire’s service fee, set at 0.825% for properties over €16,800. The fee is subject to VAT (value added tax) of 19.60%. If each party is represented by their own notaire, that fee is split between the two. Prior to the final signing, the notaire will send the buyer a completion statement showing the balance of the purchase price and all other fees and taxes required to complete the purchase. The buyer will need to get those funds into the escrow account of the notaire in time for the date fixed for the signing of the deed of sale, the acte de vente. The buyer can either be physically present to sign the acte de vente, or arrangements can be made for a Power of Attorney to enable another person to sign on the buyer’s behalf. When the acte de vente has been signed, the notaire distributes the funds to the respective parties: the purchase price to the seller, the taxes to the state, fees and charges owed to the building management, commissions to the real estate brokers, and keeps the amount of his own fee. Any conditions for completion of the sale, including the minimum acceptable terms for financing if the buyer will be seeking a mortgage. The party to whose benefit any conditional clause was written will be released from the contract if that condition is not fulfilled. The final (last possible) date for signature of the acte de vente. Upon the signing of the preliminary contract, a good faith guarantee of 10% of the purchase price is paid into the escrow account of either a notaire or an estate agent. The buyer may be able to negotiate putting only 5% down, but will in any case responsible for the 10% if he defaults. The buyer will lose the good faith deposit if he fails to meet his obligations to purchase the property in accordance with the timing and conditions set out in the preliminary sales agreement. Acting in a timely manner to secure your loan and to arrange your final payment at closing is important to ensuring that this problem does not arise. Paris real estate has been an incredible investment over the past decades, rising dramatically in value since the early 1990s. The average price in some arrondissements has doubled, tripled or even nearly quadrupled over the last 25 years, with an average annual appreciation of around 10% in some arrondissements, making it a wise investment even as it provides enjoyment and lasting memories. A recent study places Paris as one of the two top European cities for real estate investment. This is mainly due to a high concentration of successful companies and research and development facilities in the city. Paris has come in second behind London in an annual ranking of Europe’s top 100 cities for real estate investment, meaning the French capital is a wise choice for commercial and residential investment. Investment management company LaSalle’s latest edition of the European Regional Economic Growth Index (E-REGI) finds that Europe’s economy is chiefly driven by dynamic urban hubs such as Paris. LaSalle’s E-REGI identifies cities in Europe with the best investment potential in order to guide overseas property investors looking to place capital in Europe. The 16th edition of the E-REGI finds that Paris’ gross domestic product has risen of late, while the Île-de-France region “generates about a third of the national wealth and is home to the highest concentration of large firms in continental Europe” notes Mahdi Mokrane, LaSalle’s head of European research and strategy. The dominance of the London and Paris markets is consistent with the previous year’s findings, where they enjoyed the same honors. Yet, Paris does have a distinct advantage over London in that it contains 29 of the Fortune 500 companies’ headquarters, while just 19 are housed in London. Moreover, Paris spends substantially more on research and development, outspending entire countries such as Spain, Sweden and Russia. For these reasons, Paris is considered a “constant” city, one that combines healthy capital with secure prospects in the long term. The study notes that the city’s score this year “recorded significant improvement, driven by a large increase in the GDP component, demonstrating the strengthening dynamics in the French capital.” Following the Brexit vote earlier this year, it would seem that Paris is well positioned to take over the top spot. LaSalle has been publishing the annual index for 16 years, and over that period, Paris has ranked in the top three 11 times. This is reportedly due to the city’s “extraordinary economic resilience combine with a deep and transparent real estate investment market.” The report explains that this resilience makes investing in the city a beneficial move. London and Paris are followed by Istanbul, Stockholm and Luxembourg in the ranking. Eight other French cities placed in the ranking, among them Lyon and Toulouse, in the 24th and 29th spots respectively. Yes. But, exchange rates can be prohibitive if you are moving money from other currencies. If your home currency is not Euros, working with a currency exchange service is key to getting favorable exchange rates on transfers, mortgage payments, and other financial needs. If you take out a mortgage in France, you will be required to establish a French bank account for your monthly payments. Even if you don’t, most utilities and other French services can be paid by automatic debit if you have a French bank account, so most owners establish one regardless. pay income tax on any income deriving from activities in France (including rental income from the property). Apartments in Paris are sold as condominiums, with each owner in the building owning and sharing in a proportional amount of the building dues based on the proportional size of the apartment. The amount of the building dues will vary depending on the number of apartments and the relative size of your apartment (which determine your proportionate ownership of the building), as well as the services and amenities in the building: an elevator, a live-in concierge, a courtyard with flowers that need tending, collective water and/or heating are some of the factors that will play into the amount of the dues. The fixed quarterly dues take care of insurance, taxes, and the regular maintenance and upkeep of the building amenities, as well as the service fees of the syndic, or management company. Any special maintenance or updating – a roof that needs to be redone, refurbishing the façade of the building, or adding an elevator – are voted on by the owners at an annual meeting, or at a specially convened meeting if the need is urgent or if a particular owner wants to bring a point up for order outside the regular annual meeting. Any special projects that are approved by the owners are paid for by special assessments, which are similarly accorded in proportion to your share ownership of the building. On average, an apartment of about 80m2 will have dues of between 150 to 300 euros per month. Dues are paid on a quarterly basis. There is no Multiple Listing Service (MLS) in Paris. With over 3,500 agencies in Paris alone, finding a property is a difficult task for resident or non-resident buyers. A comprehensive property search requires visiting scores of agencies, scanning websites, and pursuing numerous listings in each individual neighborhood. What’s more, about 40% of the properties in Paris are sold directly by the owner. Visiting those properties is yet another challenge. 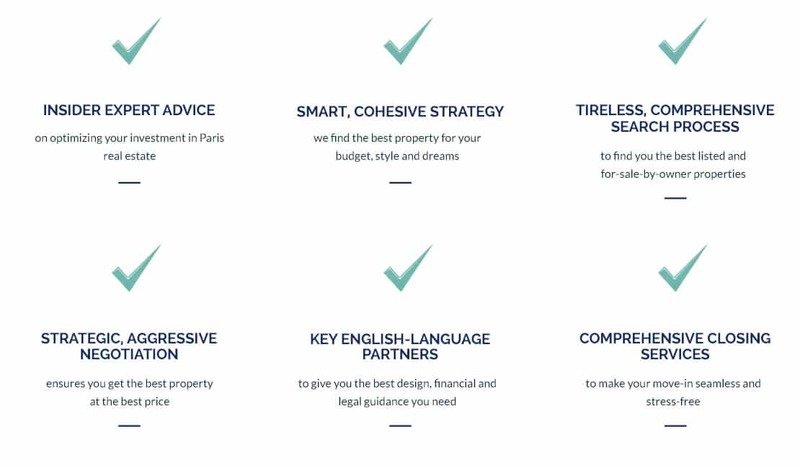 Paris Property Group’s approach is comprehensive. Working one on one with a search consultant, you access all the best properties on the market, and are assisted with the evaluation, selection, and negotiation. Listing agents represent the seller and do not have an incentive to look after your interests. That is where we can really be of value to you, saving you not only time, but money. See a sample property report here. After we’ve found your perfect place, we manage the entire process through to closing. We oversee the signing of the preliminary purchase agreement, then we help you find all the resources you need — mortgage lenders, banks, renovation and decorating experts, legal and tax advice. After the purchase is complete, we set up your utilities, telephone, building management communications and homeowners insurance, all to ensure your smooth transition from property buyer to property owner. Another important factor to consider: Paris Property group is a licensed real estate agency, unlike many supposed property search agents in Paris,. We carry the requisite insurances and real estate licenses to protect your interests. From an investment perspective, unlicensed “search consultants” fees cannot be included in the purchase agreement, and ultimately are not included in your capital gains basis when you sell the property. Most importantly, when you work with an unlicensed agent, you are not protected by the French real estate laws and regulations that protect you against their errors, missteps or misrepresentations. Your investment is an important one. Don’t trust it to just anyone. Property search service is a professional activity governed by French law regulating real estate sales. Paris Property Group is fully licensed, bonded, and insured, in accordance with the law. Beginning in 2012, if your net wealth in France exceeds €1.3m, the total value is subject to wealth tax. Previously 800K euros could be exempted, but no exemptions are allowed now. If your property is valued at less than €1.3m no wealth tax reporting is required. Taking a mortgage to keep under this threshold is one way to ensure protection. Only mortgage debt and presumably other valid third party debt may be taken into account. Starting in 2012 there are only two tax rates that apply: 0.25% on net wealth valued starting at €1.3m up to €3.m, and 0.5% on net wealth of €3m and above. So, for example, if your wealth is €1,300,100, the 0.25% rate is imposed on that full amount or 3,250 euros a year. One important change affects the popular strategy of holding French real estate in an SCI. Going forward, when valuing the shares of a real estate holding company, such as an SCI, shareholder debt may no longer be taken into account. This neutralizes a typical planning strategy, namely, designating a significant share of the cost of the real estate on the books of the SCI (or other form of holding company set up for that purpose, such as an LLC), as “shareholder loan”. Before the advent of the New Law, the shareholder loan was considered debt in valuing the shares of the holding company, usually resulting in a negative value for the SCI shares and hence no wealth tax on those shares. This strategy is no longer effective since only legitimate debt such as a mortgage is allowed now. This change is retroactive, so real estate holding companies (defined as companies whose assets consist predominantly of real estate) set up in prior years must be revalued when determining the value of the holding company for wealth tax purposes. For more information see the memo on our blog. The fragmented French market can make that a formidable task. With no Multiple Listing System, individual agencies only list their own properties. They can’t and won’t show you properties listed elsewhere because there is generally no sharing of commissions. Sometimes properties are listed with more than one agency – which makes for even quicker sale, before you have a chance to make your move. There isn’t even one comprehensive listing site for all properties. Thus, buyers must go from one agency to another, leaving their contact information and hoping for the best. Should you happen to walk in at the right time, you might be in luck. But since good properties sell quickly, competition among buyers is fierce and agencies have no real incentive to maintain a relationship with you as a buyer. Furthermore, France has the biggest private seller market in Europe: more than half of the properties change hands without the use of a real estate agent. So even if you had first access to the properties listed in the 3500 real estate agencies in Paris, you would still only know about half the properties on the market. The 15th arrondissement runs the range, from pricey bourgeois to some of the most affordable neighborhoods in west Paris. The northern areas around La Motte-Picquet and avenue de Suffren, along the border of the 7th near Les Invalides, boast the highest prices in the arrondissement, and also some of the loveliest buildings. High-rise buildings along the river boast spectacular views, but the buildings are of a contemporary sort that haven’t aged well, making them some of the best value opportunities for river view property. As you move closer to the southern edge of the 15th near the Porte de Versailles, the properties become less prestigious, matched by dramatically lower property prices. The area around rue de Commerce has a charming village-like feeling, bustling with shops and cafés. Apartments in this area tend to sell quickly, by word-of-mouth, to families seeking proximity to some of the most prestigious (French and bilingual) schools in Paris. The 15th seems to please everyone – families, investors, and a growing number of foreign buyers. 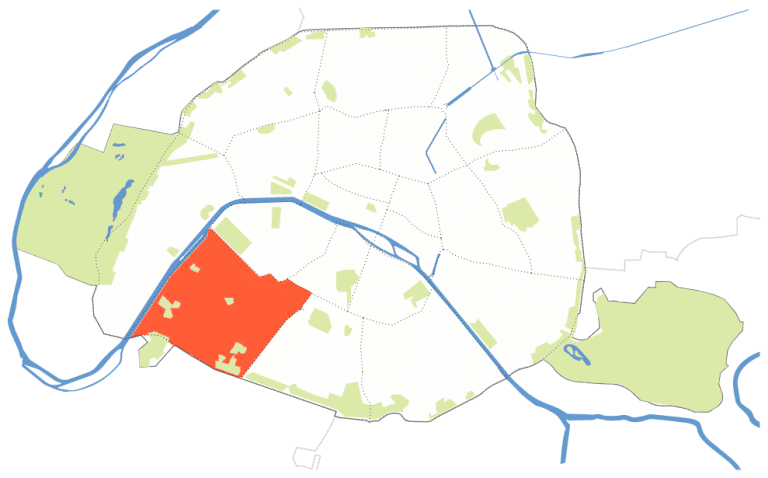 In the northern areas around La Motte-Picquet, the place de Breteuil and towards avenue de Suffren, prices are at their highest for the arrondissement; head southeast for more reasonable prices. 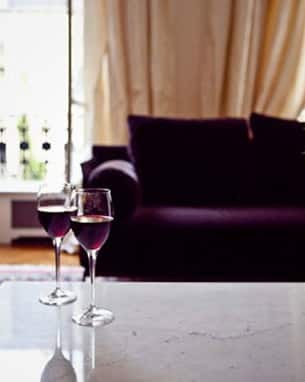 For now, it is still possible to find an affordable apartment in good condition around the Porte de Versailles. The new Beaugrenelle redevelopment along the river is giving a boost to that neighborhood. Average price: 9,055 €/m2, ranging from 6,686 € to 12,270 €/m2, depending on the area. In the 1980s, President Mitterrand unveiled a new architectural concept to move Paris into the next millennium. His “grands travaux” brought both praise and horror as they evolved, but no one can deny that the final result is a renewed and diverse city. Mitterrand is responsible for commissioning the Grand Louvre’s new glass pyramid entrance (created by I.M. Pei), the move of the Ministry of Finance into a new building (designed by Paul Chemetov), the Grande Arche de la Defense (by Von Spreckelsen), the Cité de la Musique (by Pritzer-prize winner Christian de Portzamparc), the Institut du Monde Arabe (by Jean Nouvel), the Opera Bastille (by the less-accomplished Carlos Ott), and the new library (by Dominique Perrault), now named the Bibliotèque François-Mitterrand. Apartment buildings from this period offer large windows and storage space, but lack the architectural details of previous styles. Styled as a typical Parisian bistro, chef Guillaume Delage, who studied under Michel Bras and Pierre Gagnaire, will surprise you with his delicate and savory dishes which are a perfect mix of modernity and tradition. A neighborhood gem, Le Grand Pan serves unfussy French food in a welcoming environment. It’s a meat lover’s paradise, serving succulent steaks, and market-fresh veggies. During winter months, you’ll find authentic black French truffles, and great wines all year round.